Theses are the Baked Sugar Cookies with something special on top. We sell the portioned cookie dough that you can bake straight from the freezer until the edges are golden brown and just set in the middle. Allow to cool and enjoy as is or ice them with my simple recipe. You can really get creative here. 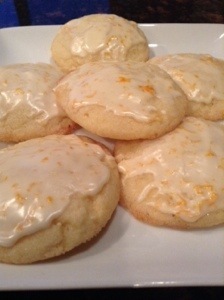 In the picture, this is iced using powdered sugar, zest of a orange, and a splash of Grand Marnier. All I did was use a couple tablespoons of powdered sugar, zested an orange using a microplane, then just added enough GM to make a liguidy-paste that can easily spoon over the baked cookies. Allow the icing to set and enjoy. If you didn’t want to use alcohol, just use water. Otherwise, other ideas are lemoncello and lemon vest, Arancello with orange zest, or Disaronno for an almond flavor.